Hugh White got it wrong last week . He erroneously asserted that the two amphibious Landing Helicopter Dock (LHD ) and three Air Warfare Destroyer (AWD ) ships currently being built for the Navy are destined for a ‘pointless and unachievable mission.’ But last week’s offering is just more  of  the  same  anti-large ship rhetoric that Professor White has pushed over the last ten or so years. It’s an argument which is becoming quite weary. Here’s why. The prevailing conception of what amphibious manoeuvre entails today has been distorted by modern Hollywood depictions of history. Horrific scenes portrayed in film such as Saving Private Ryan, The Thin Red Line and The Pacific reflect the tactics and capabilities of a bygone era that have been well and truly usurped by modern technology, evolved mission sets and dramatically reduced tolerance levels for loss by the community. Perhaps this is why Professor White’s opinion is so surprising. As one of Australia’s preeminent strategic thinkers and a respected former Defence Deputy Secretary, he should be better informed than the average lay person watching the big screen. No astute military force in the world promotes the types of amphibious assaults undertaken in World War II or the Korean War as a feasible tactic in contemporary conflict. Not even the US Navy and US Marine Corps—undoubtedly the world’s most powerful and capable amphibious force—believe in the utility of directly opposed amphibious landings. Twenty-first century amphibious manoeuvre, underpinned by concepts like Ship-To-Objective Manoeuvre  and Sea Basing, are about avoiding direct engagement when lodging a force from the sea to the land objective. The ADF’s developing amphibious operating concept  (PDF) doesn’t envisage high-intensity conflict or major war. Rather, within the framework of Australia’s overarching maritime strategy, the concept is being developed for the likely future needs of Southeast Asia and the South Pacific. Emphasis is being placed on military support to humanitarian assistance and disaster recovery, evacuation operations from unstable areas, peace-enforcement, peace-keeping, and, domestically, Defence Aid to the Civil Community (DACC). 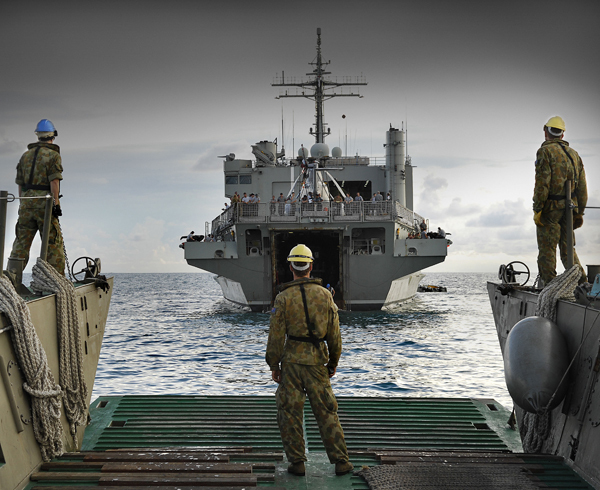 Within these mission sets, the ADF is focussed on being able to integrate and enable inter-agency, international organisation and NGO roles and needs within the amphibious capability. In the immediate aftermath of the 2004 Indian Ocean tsunami, Australia and the US rapidly provided extensive assistance to Indonesia and Thailand through amphibious forces. If scenarios similar to East Timor 1999 or 2006 arose again, the LHDs would allow the ADF to deploy larger forces more expeditiously into more areas simultaneously, thereby permitting restoration of security and peace more quickly. Traditional amphibious operations will still have a place for the ADF, but adapted to the contemporary world. A raid from the sea could be undertaken by LHD-based special forces against a terrorist group to recover Australians hostage, or to seize materials related to weapons of mass destruction being proliferated illegally by hostile actors. A demonstration, through presence activities or training exercises, could provide a cost-effective way to deter aggression or to shape and influence a precarious environment. The ships have been bought and are nearing completion. Army and Navy personnel are already training closely together. Thoughts about how and where the ADF’s amphibious capability could be employed would be more useful to practitioners than inveterate opinions on decisions made many years ago. Possessing a flexible and capable amphibious capability with utility across a wide range of missions makes clear strategic sense. Australia’s littoral strategic geography demands such a capability, as do the challenges the ADF and whole-of-government space are likely to face in coming decades. The investment in amphibious capability will undoubtedly provide our national decision-makers with great flexibility in years to come, and will prove to be a sage investment on behalf of the taxpayer. And believe it or not: it’s not all about China! Thomas Lonergan is a current serving Australian Army officer with recent experience in the ADF’s emerging amphibious capability. These are his personal views. Image courtesy of Department of Defence .